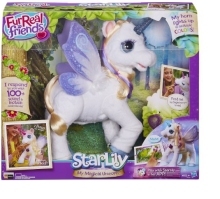 The Furreal Friends StarLily My Magical Unicorn Pet Toy is one of the must have toys for Christmas 2015. We constantly track for stock which ensures you will be the first to know when availability is found. 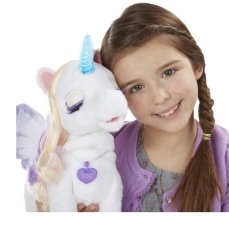 The StarLily, My Magical Unicorn toy is the pet of every girl's dreams to become their very best friend. StarLily responds to touch and voice with over 100 different combinations of life like movement and voice. She can spread and flutter her wings as well as move her front hoof and you can even play with her on her app! Recommended for ages of between 4 and 10 years. requires 4 x C batteries which are NOT included. We constantly check for StarLily, My Magical Unicorn stock, so you don't have to. Receive email alerts when StarLily, My Magical Unicorn online stock is found.